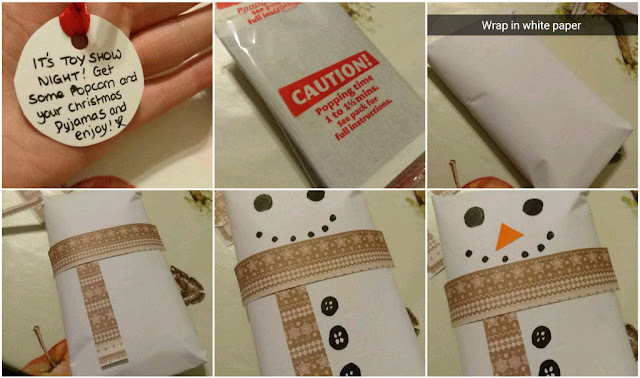 I was feeling crafty last week after carving my pumpkins for Halloween, so I decided to have a browse on Pinterest for Advent Calendar ideas. I was initially going to make something from felt, but with three kids I knew it'd end up massive if I wanted to put a treat in every day. I spotted my stack of empty Glossyboxes and an idea was born - I decided to make advent cards (similar to the ones I made in 2014 here) and make an Advent Box full of treats and activities for the boys. My boys are 12, 3 and 3 so it's hard sometimes to find things they'll all enjoy - hopefully you all get some ideas. I'll link everything as I go along. All links are in ITALICS. Apologies for the screenshots, I didn't have the big camera out so hopefully you'll get the gist of it from the Snapchat grabs. 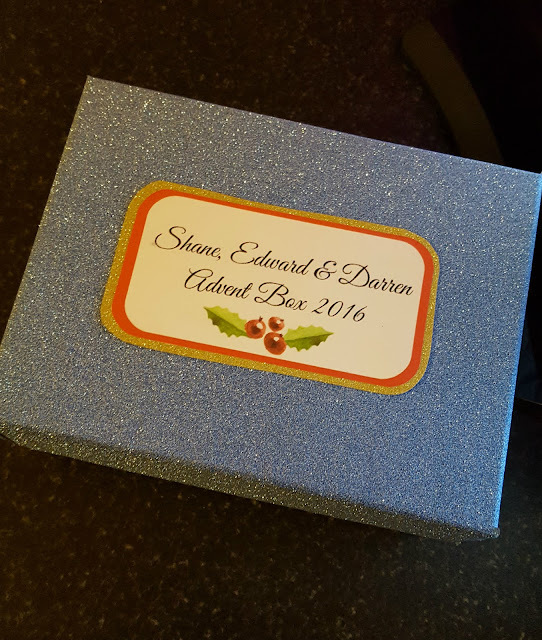 I covered an empty Look Fantastic Beauty Box with glittery sticky contact paper from Tesco. It costs €5.50 per roll, they had pink and black in my local Tesco too (Longford). I had initially used a Glossybox (also pictured) but in the end it just didn't quite hold everything so I re-used that and made a Beauty Advent Box for my Sister using samples and little makeup bits. You could use any box and any paper, wrapping paper would be lovely too. I designed a simple label online (I use Canva for all my photo editing and designing) and printed it out, then stuck it to some glittery card that I got in Sostrene Grene in Athlone (€1.40 for 3 sheets, similar card available in Mr. Price or Dealz). I've seen big cardboard gift boxes in Mr. Price for under a fiver, and Dunnes have gorgeous looking ones that already have Christmas prints on them. A shoebox will do the job too. This paper is SO SPARKLY. This was the initial box I used, I took the label off and replaced it with one for my sister and was able to fit 25 beauty treats in. I have a miniature Christmas tree that I'm going to tie these tags to, I got mine in Homestore & More last year. 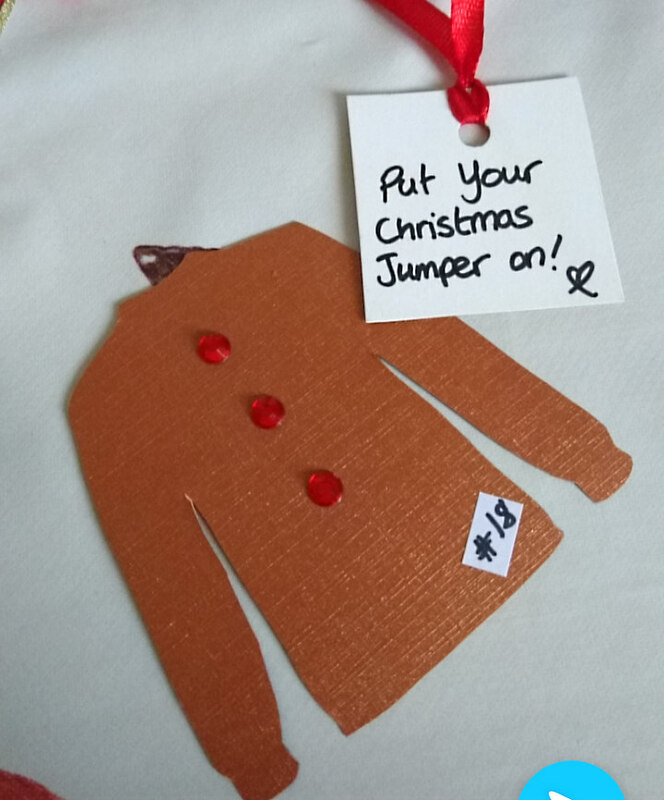 It's in storage at the minute so I can't show you - but loads of shops do miniature trees, or you could just use a jar or envelope to store the tags. 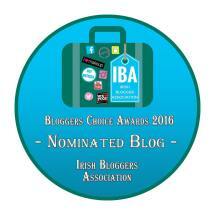 I got these tag templates from Simple as That Blog. 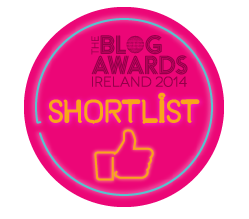 You can also create your own using the free shapes on the Canva site. I printed them out onto red paper (from a standard pack of coloured A4 paper), cut the shapes out, outlined them with a black Sharpie, then stuck them down on to the gold card I used earlier. Then I cut around the outside, punched a hole in the top and attached some ribbon. To stop the ribbon from fraying, I cut it at an angle and then held it near a flame to seal it (don't put it on the flame or it'll burn up). These will vary so much from family to family. Firstly, think about things that will suit your children's ages (if you're doing it for children). I wanted simple, fun, Christmas activities that don't depend on any given day. Also, you do NOT have to go out and buy a load of stuff. See what you have already - books, games, DVDs, music, craft supplies, toiletries, cookie cutters, whatever. 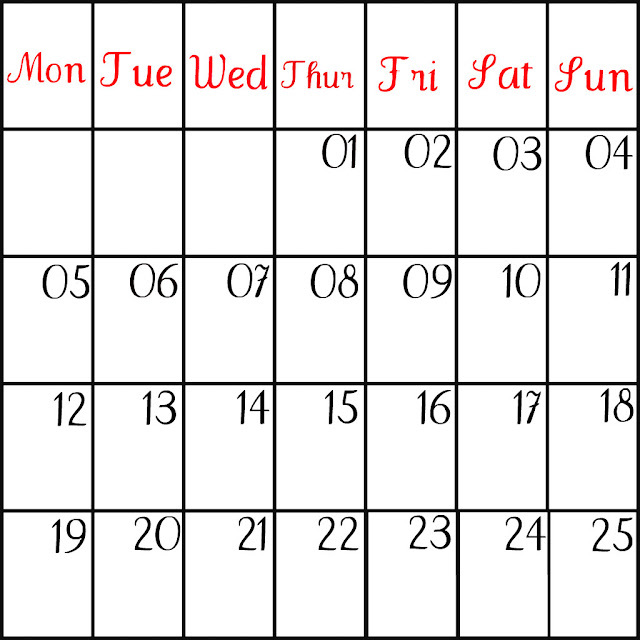 The first thing I did was work out which dates were Fridays, Saturdays, and Sundays because my eldest boy doesn't get Holidays until December 22nd, so there was no point in planning daytime activities if he couldn't take part. The Late Late Toy Show is on December 2nd, so that means it'll be repeated on Sunday 4th for very young children. 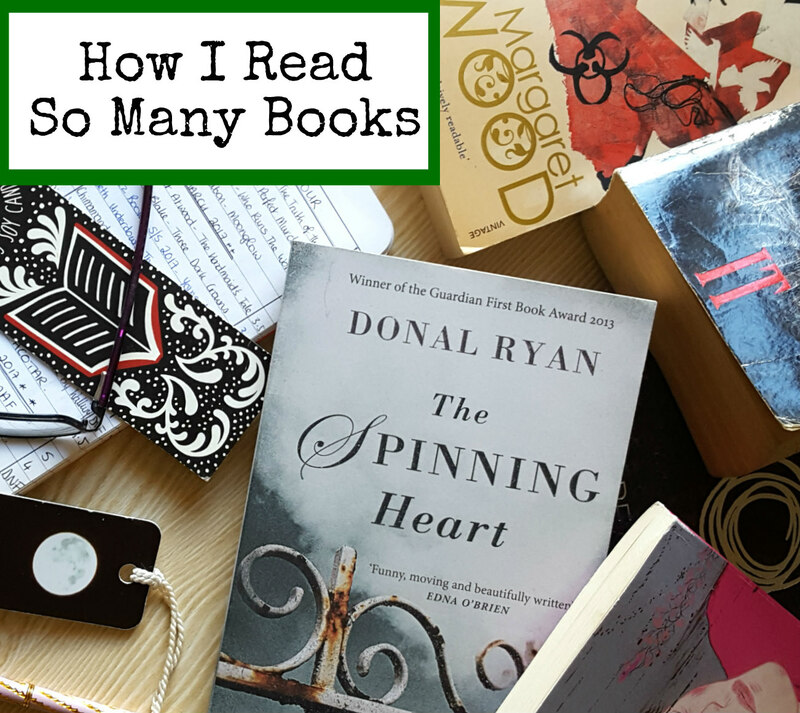 Work out if you've anything booked, or if there's anywhere you want to go, and write it all down. 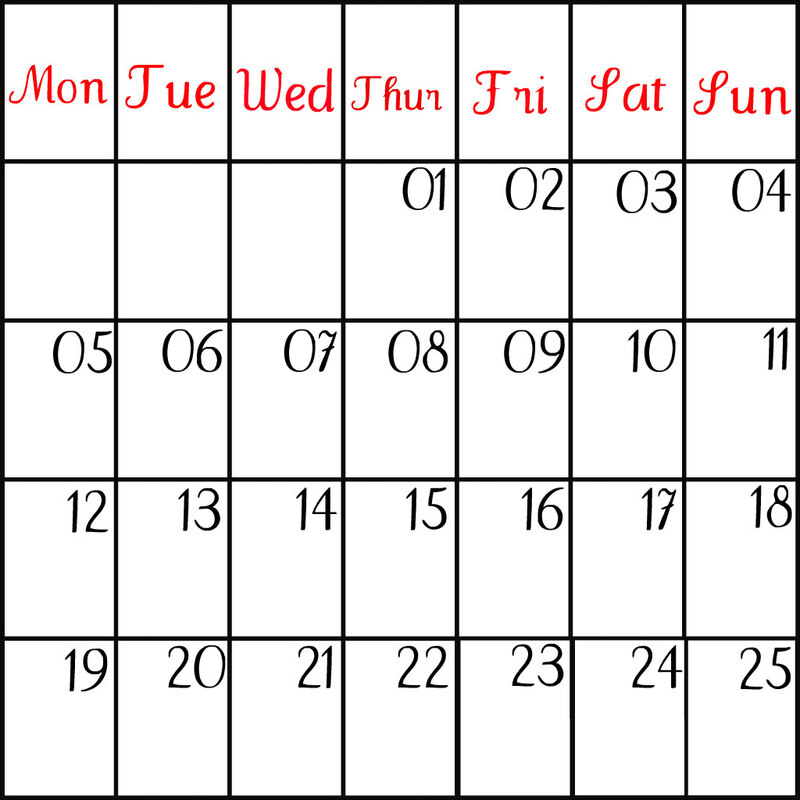 Here's a table I've done for you showing which dates fall on weekends, this could be helpful if you printed it out so you could jot down ideas for different days before deciding. PINTEREST IS YOUR FRIEND. You can find thousands of printables on Pinterest - just type in whatever you're searching for in the search bar on the top of the site, e.g. "Christmas Envelope Printables". In no particular order (so don't pass any remarks on the numbers on my tags). If you've a Santa visit booked or planned, you can print out your booking confirmation or just type out a little note and pop it in an envelope. I love printable Christmas envelopes - I got this one from Greetings Island. Write a note on the corresponding day's tag and pop the envelope into the box. The Late Late Toy Show is a Christmas tradition in its own right, for me it marks the start of proper Christmas excitement and I always try to have at least the tree up for it. This year, it's on Friday December 2nd. I got two bags of Microwave Popcorn (the twins will split one bag). I wrapped them in plain white paper, then added coloured paper for a scarf, drew on eyes and buttons, and cut a tiny triangle for a nose. 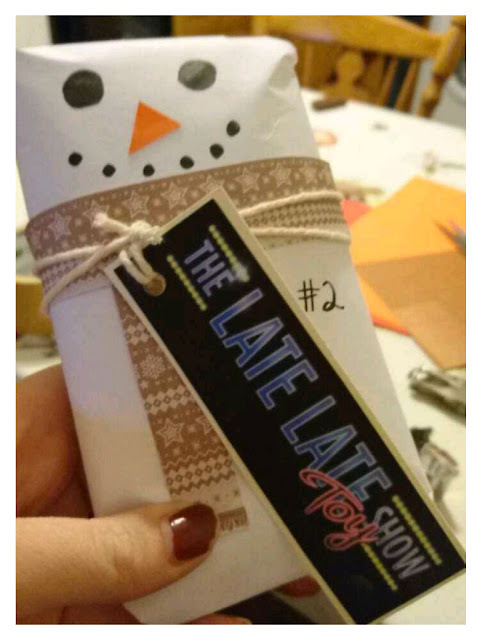 I googled the Late Late Toy Show logo and printed it out, glued it to card, punched a hole and tied it around my "snowman". I wrote a message on the Day 2 tag and wrote #2 on the snowman before putting him in the box. 3. 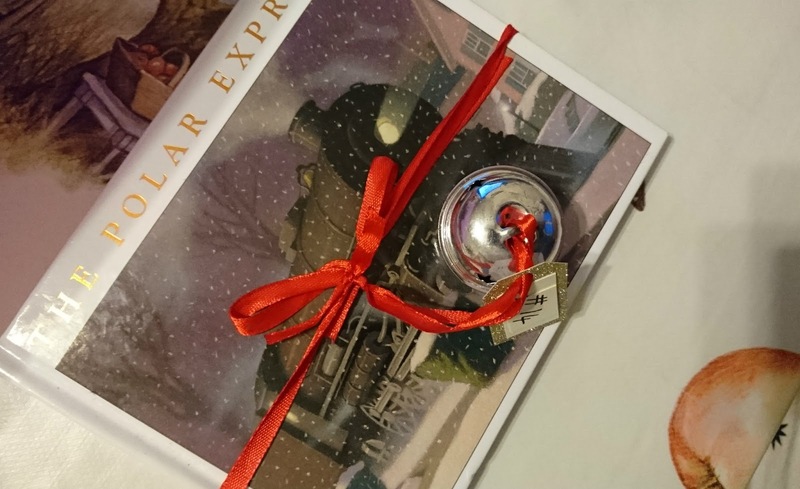 Read and Watch "The Polar Express"
The Polar Express is a really beautiful story and film for children. Very young ones may be a little disinterested so you could choose something more suited to them, or choose whatever film you want. I already had this book and DVD, and we got the little bell from an old Christmas decoration and tied some red ribbon through it to go with the one in the film. The copy I have is this small one from The Book Depository. My DVD isn't a bootleg copy - I always throw out storage cases and use plastic sleeves to save space. I found a silver bell afterwards that was more suited to the theme, it was in a 6 pack from Dealz last year. I know what it's like to have grumpy little ones falling asleep in the middle of the Toy Show on the Friday night, so the matinee on the Sunday (Dec.4th) is sometimes a better option. For this one, I bought a bag of mini marshmallows and divided them into three little bags, then tied with ribbon. I got the marshmallows in the baking section of Super Valu but I've seen them in Dealz too. 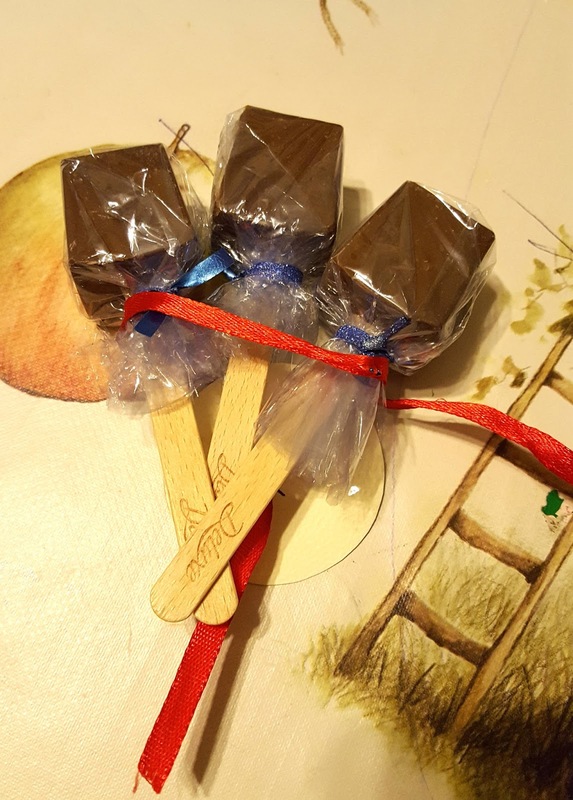 I bought the hot chocolate sticks in Lidl (€1.99 for a pack of two) and wrapped them individually. 5. Play some Reindeer Games! I found this printable game via Pinterest. It's from 733blog.com. I printed it out two per A4 sheet, stuck it to card, then did the same for the pieces and cut them out. I put them into individual bags so everyone could have their own pieces. 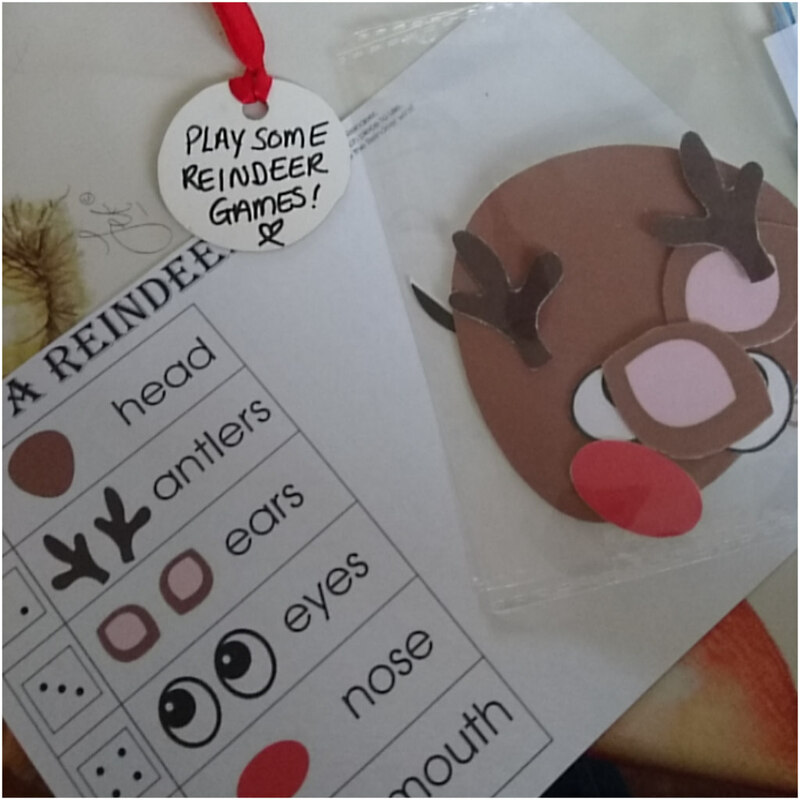 The object of the game is to roll the dice, and place a reindeer piece on your play mat. The first one to complete their reindeer wins! I printed out one for me too... I'm going to use blu-tac for the kids to stick their pieces down. I couldn't find a dice in the house so I found some dice erasers in Mr. Price and popped one in. I made an envelope from a sheet of A4 paper folded in half. This could actually be two different day's activities, but I thought it'd be fun to make snowflake cookies while watching the film or watch the film when the cookies are ready to eat. There are millions of simple cookie recipes available, just google "simple cookie recipe" or get one of the ready-mixed packs in any Supermarket. 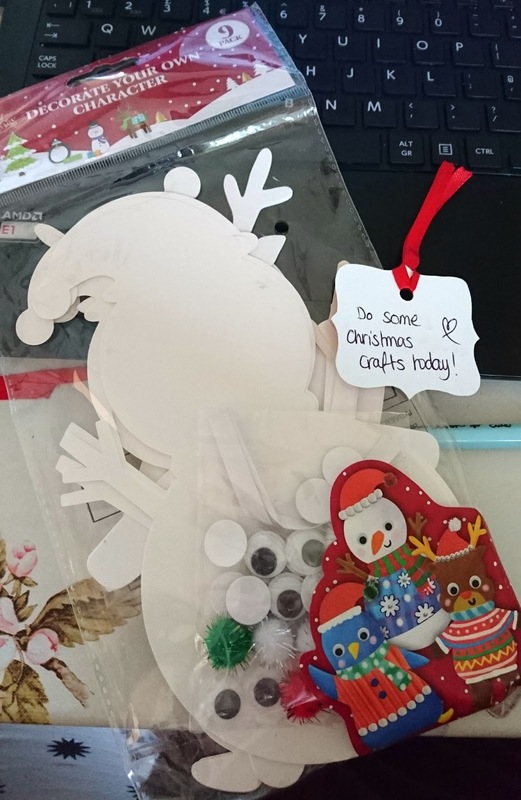 I bought my snowflake cutter from AliExpress ages ago but you can get them in Homestore & More or TK Maxx (keep an eye out in Lidl & Aldi before Christmas, the cutters sometimes pop up in the Special Buys). 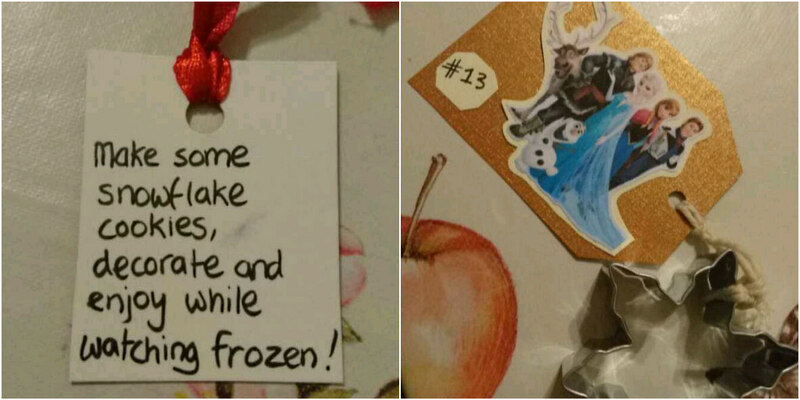 I made the little tag by printing out a picture of Frozen and sticking it to some card. I thought the Rafaello sweets looked a little like snowballs, so I bought a three-pack (one for each child) and wrapped it up in plain paper and ribbon to make it look like a Christmas cracker shape. Even though my 12 year old has passed this stage, he likes to use the opportunity to drop hints about things he'd like, or just to keep up appearances for the younger ones. I can't remember where I got this particular printable but there are hundreds available if you search "Santa Letter Template" online. There are lovely ones here on Spaceships and Laser Beams. For the envelope I just used the same template as I did in the "day out" advent activity, but printed it on red paper. I stuck a white address label on the front. 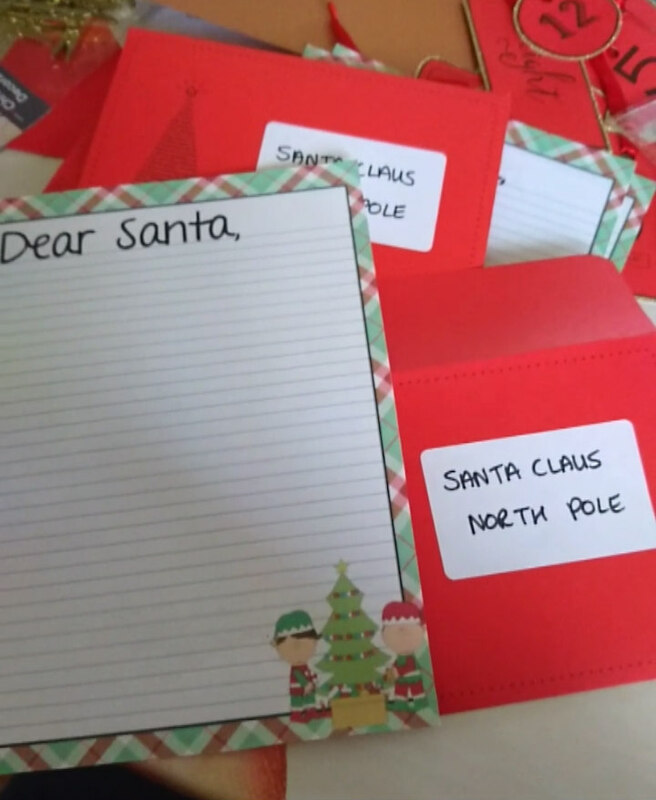 If you write a letter to Santa, make sure your child's name and address is on the letter, and send it to "Santa Claus, North Pole" with a stamp on the envelope, An Post will send your child a reply from Santa. I haven't done it in years so I'm not sure what the reply is like, but it's always exciting for children to see post with their own names on! Or, you could type something out yourself and post it to your children. 9. Put Your Christmas Jumper On! Pretty self-explanatory, I saved this one for a Sunday when I knew it would be more likely that we'd be out and about. Obviously I couldn't put their Christmas jumpers in the box, so I drew out a jumper shape on card and stuck some jewel stickers on (Mr. Price and Dealz have loads). 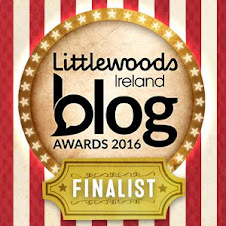 These are the jumpers I bought for the boys this year (from Littlewoods and Oxendales (linked). I bought a new Christmas CD this year (am I the only one who still buys CDs?!) - Now That's What I Call Christmas. I couldn't fit the CD in the box so I drew around an old one onto some silver card and put some Christmas stickers on. 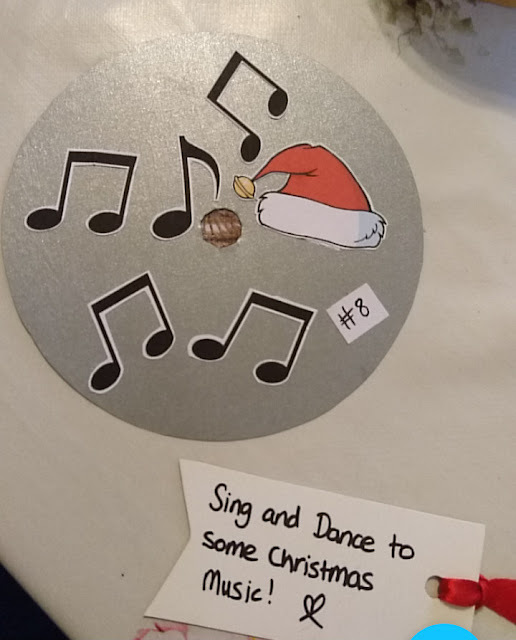 To make the stickers I searched "music notes clipart" and "Santa hat clipart", printed them out and stuck them on. 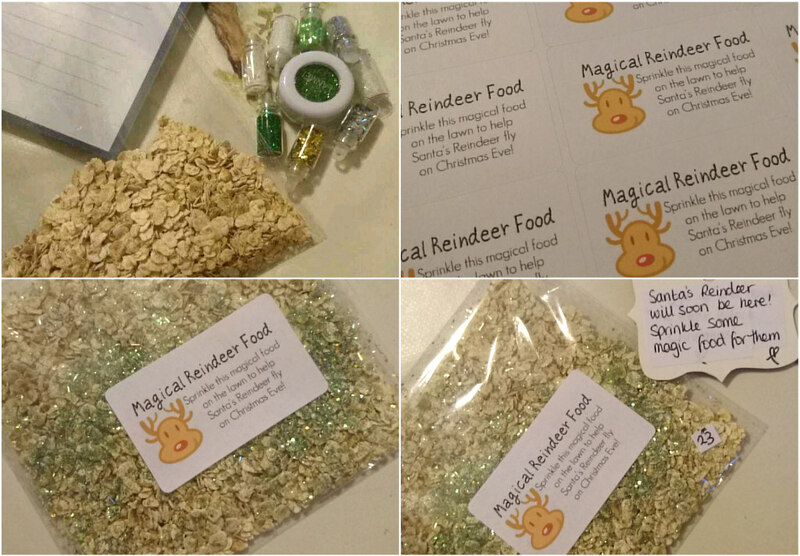 You can buy reindeer food in different shops at Christmas, but I bought it last year and it was essentially just glitter and oats. So, I got an empty cellophane bag and put some porridge oats and glitter in it. I designed some labels in Open Office (like Microsoft Word) and printed them on a sheet of labels. You'll get glitter in any euro shop, I had some nail art glitter left from my days as a collector of nail art things. They'll probably think it's a lollipop or sweets from the hint, but this treat is a sheet of stickers for each child. I got the stickers in Tesco but you can get stickers in any Euro shop. I think Euro Giant is particularly good for character stickers. I wrapped them up in red paper and added some string and snowflake confetti (this is scatter confetti from last year, Lidl and Tesco have it in again at the moment). I wanted to include one piece of Lego with the calendar because all three boys love it. I ordered three Lego Santa figures from eBay - I'm not going to link the seller because they're based in Hong Kong and I think it's too late now to order. There are loads from UK sellers, just search "Lego Santa Figure" - or just use a standard minifigure! Doesn't have to be Santa. 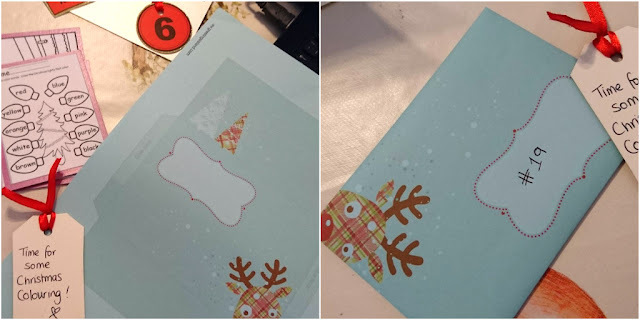 Because they haven't arrived yet, I found some printable Lego man gift tags online and printed them out, then glued some paper on to make them look like Santas, one for each child. The gift tag templates are a free printable from sometimes-homemade. I made the boys a decoration each, but you could choose one for your child from any shop, or get a personalised one, or let them choose one - I know some people like to get a new special decoration every year. For this, I made some cross stitch ones and then used another printable envelope (template from this heart of mine ) to pop them in. 15. Time for some Christmas colouring! 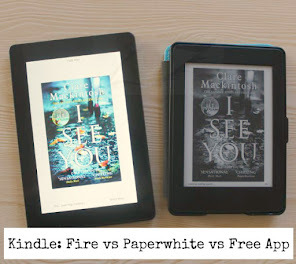 For this activity, I used Google to find some images for the kids to colour. If you're looking for something specific, as I was for my 12yo, I searched "Minecraft Christmas Colouring" until I found a suitable image. I saved it and printed it out, then stuck it to some backing card. I did the same for the boys, I think I googled "Toddler Christmas Colouring". I used another printable envelope to keep them together. Or Gingerbread Women, whatevs. 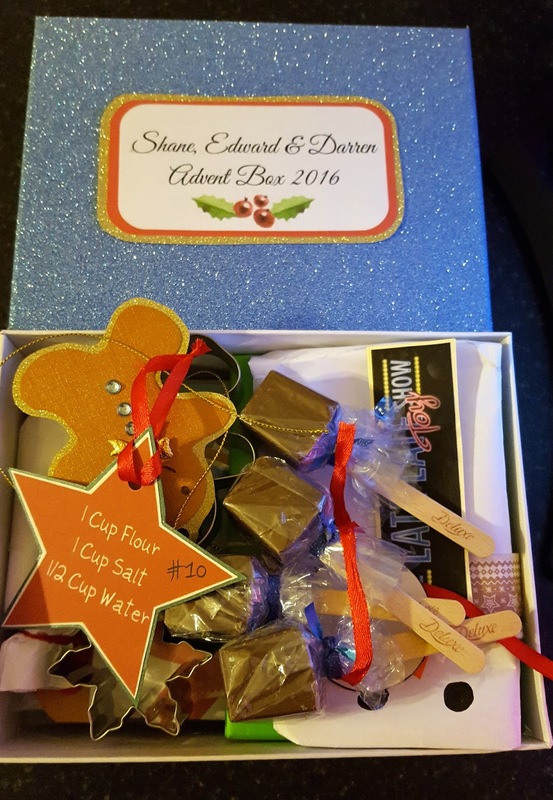 For this, I took a Gingerbread cutter from our stash, cut out a template from a piece of bronze card, added some sticky gems, then typed out the recipe for Gingerbread Men from the Odlums website and printed it out small enough to go on the back. 17. 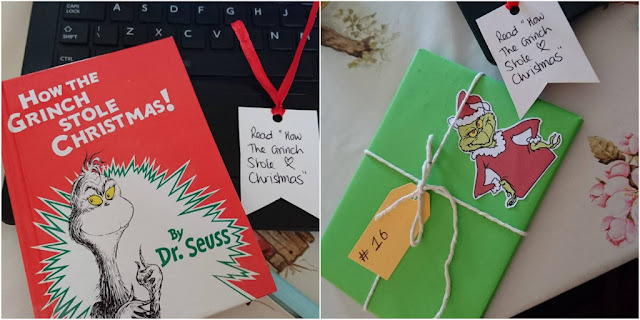 Read "How The Grinch Stole Christmas"
Dr. Seuss books are brilliant for all ages, even I love reading them. The story of The Grinch is a fun one to read in December, the movie is also great. I picked up a set of Dr. Seuss books at a boot sale, but you can get Dr. Seuss books in most book shops, it's also on Amazon, Book Depository, and Dubray. For this one, I wrapped the little book up in some paper, googled "Grinch clip art", printed him out and stuck him on the front. 18. Read "The Night Before Christmas"
I couldn't include this in my box yet because my copy is in the attic with the decorations, but I bought the little laser-cut edition that was shown on the Late Late Toy Show a couple of years ago and that's the edition I'll be using, it's lovely. It's this one by Walker Books. I got this little craft set in Dealz last year and came across it after Christmas so I put it away for this year. It's too big to fit in the box so I just wrapped it in plain paper and I'll leave it with the box. The recipe for salt dough is super simple - it's equal parts flour and salt to half part water. So if you use a cup of flour, use a cup of salt and a half cup of water. 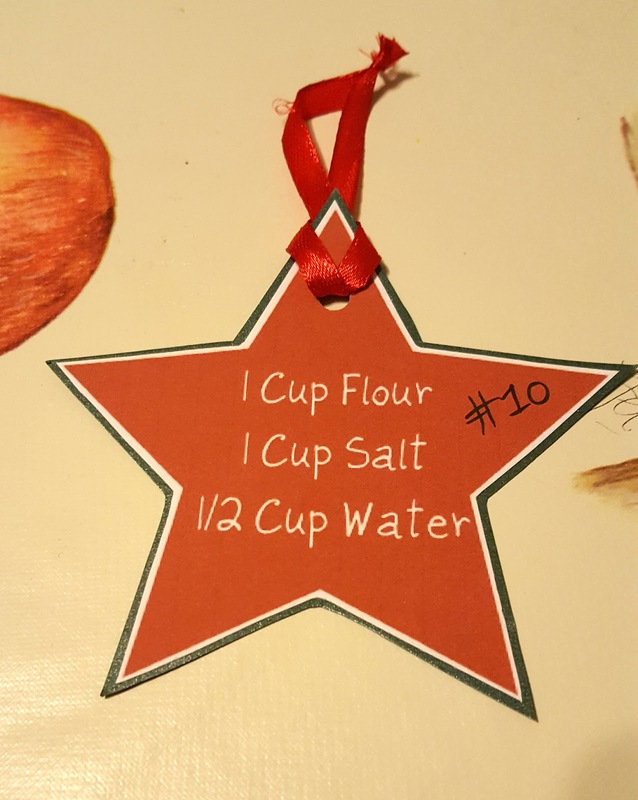 I typed it out and stuck it to a cardboard star shape, and put that in the box. I bought some Mod Podge (available at Evans Art Supplies, Cork Art Supplies, and eBay) to preserve the ornaments, so the boys can give them to their Grannies. There are some amazing ornament ideas on Pinterest but I think we'll stick to hand prints because it's fun to see the difference every year in the size of everyone's hands! 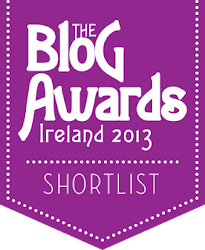 There ye go - I'm still working on another few ideas, but there are thousands out there! 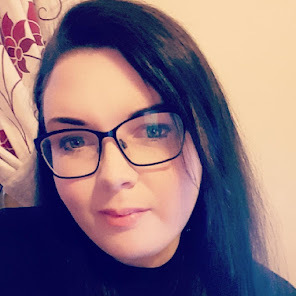 I'd love to see snaps or pictures if any of you decide to do it, I'll snap the calendar as we go along in December too. 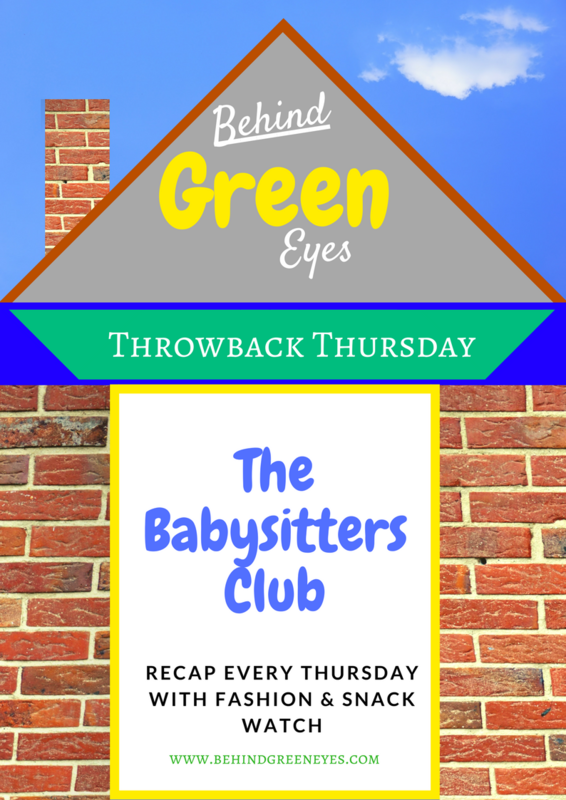 I know that the activity for December 24th will be to open the Christmas Eve Boxes - I did a post about that last year, you can read it here: Behind Green Eyes: The Christmas Eve Box. That's so special, your kids are so lucky to have you making fabulous Christmas memories for them. It looks like you enjoy doing it too. I am in no way crafty but I absolutely love this idea!!! Just super Sharon. You really put a lot of time and great effort into everything.